Medieval jazz? Sure, why not – after all, we’ve had Latin jazz. Having said that, looking at the sleeve, one feels a little apprehensive at the Olde Englishe font and Alban Low woodcut of Bad King John. A glance at the back, and we see the album features not merely a piano trio, but baroque flute, cor anglais and the spoken word. 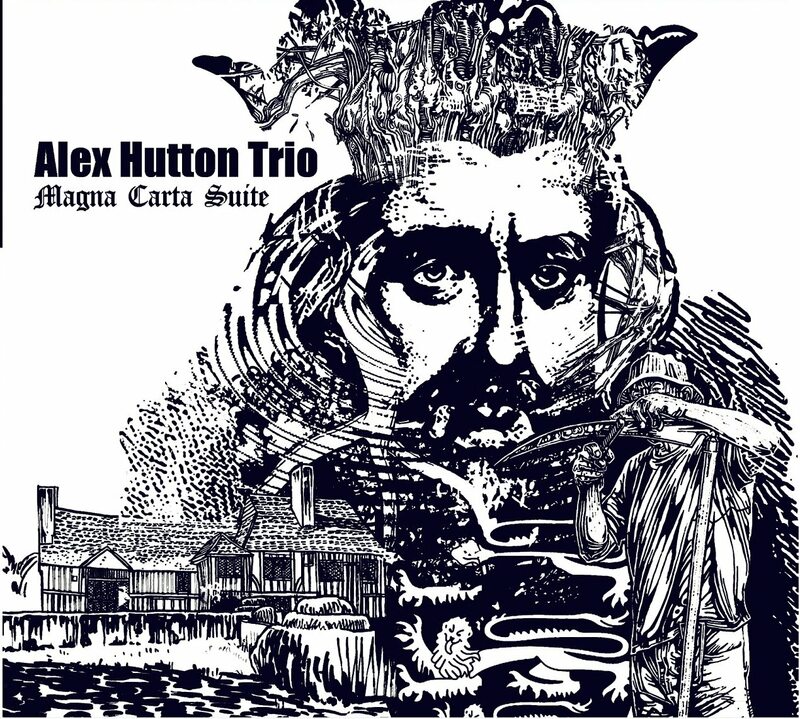 Magna Carta Suite, the fourth album from Alex Hutton, turns out to be a thing of great beauty. It contains 12 short pieces, ten of them inspired by the 800th anniversary of said document. Hutton is a busy and inventive pianist, here accompanied by long-standing musical partners Yuri Goloubev on bass and Asaf Sirkis on drums. For the most part it’s conventional piano trio music, and all the better for that, as the musical empathy among the trio is powerful. The added instrumental elements are provided by Goloubev’s gorgeous bowed bass, played high enough to sound richly melodic and cello-like on Old Yew and King John’s Hunting Lodge. Liz Palmer’s baroque flute on Old Yew is mixed low enough to provide just the right counterpoint to the bass melody. And on King John’s Hunting Lodge Liesbeth Allart’s cor anglais adds a sweet and attractive oboe-like texture that doesn’t overdo the medievalism. There’s a folky, village green feel to The Barons, toughened by a solo from Sirkis, while June 15th 1215 is rather Keith Jarrett-like, with a delicate plucked solo from Goloubev which reminds you that he spent 12 years as a classical player in Moscow before dedicating himself to jazz. Maintaining the classical influence, the pounding Gunpowder and Compass is partly based on a fugue by JS Bach. If all this makes Magna Carta Suite sound like a bit of a mish-mash, it’s actually a lot more cohesive than one might expect. Hutton is firmly on top of his disparate musical influences, and the project hangs together very well: it sounds like a suite. There are albums that you review approvingly whilst knowing you won’t ever play them again. This one I will listen to for pleasure, although to be honest only as far as track 10: I found the recitations of Neil Sparkes on Thoughts Bear Heirs to Memory and As Sunlight Passses a little portentous. The album is launched on 13th July at the 606 Club, with an additional date at Ronnie Scott’s on 13th August.